This project looks at alternative ways of designing rural one off houses. The site is located on an old Estate farm where the client was born and grew up. The House and Estate are typical of estate farms in the midlands, in that the house surround by outbuildings and walled gardens where a large amount of local stone is used. Surrounding the homestead and in various other location around the estate clusters and small woods of deciduous trees are found. The front rooms of the house, which would have been the more formal rooms, are located overlooking the grazing fields which are interspersed with mature native deciduous trees. These rooms have tall windows that come low to the floor and are recessed in thick walls with detailed architraves surround the openings. The view from the front room across the estate is uninterrupted apart from a minimal steel railing to keep the livestock away from the house. As the proposed site is currently a barren field the challenge of the project is to create a sense of place for the client and her children. We have chosen the clients memories of growing up in an old farm estate House as the starting point for the design. 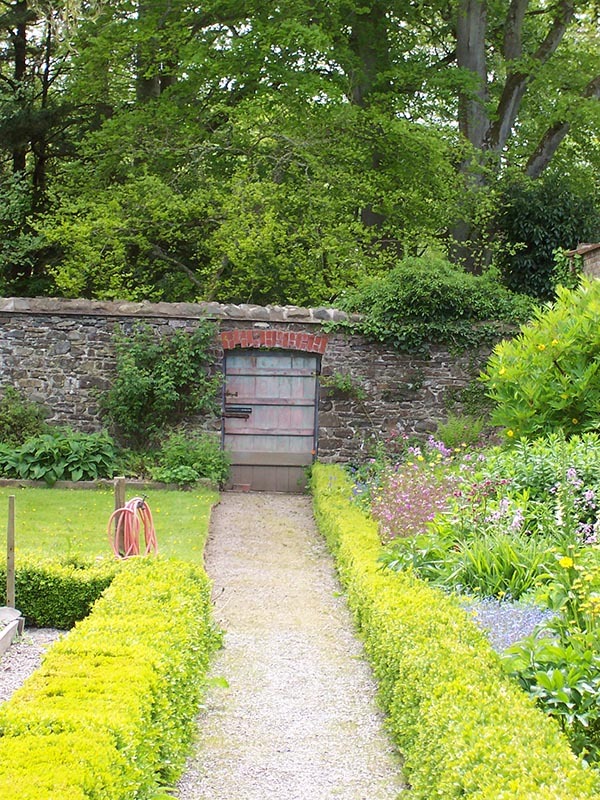 The recollection of a walled garden has inspired the layout behind the design of the house. A thick wall of stone will face north, running parallel to the public road. This will act as a line of protection against the public road and on the sunny side of this wall, much like in traditional walled gardens, the living space of the house will be enclosed. The wall will be thick enough to include the service rooms. The house will extend into the garden by way of tall double patio doors in all the rooms. This connection with the garden will make the house feel more spacious, give the inhabitants a deeper appreciation of the countryside and make the living spaces brighter. The garden will be created with the plantation of many trees that will reference the cluster of trees found around the estate. It is the space between the Wall and the garden that will become the living space of the house. 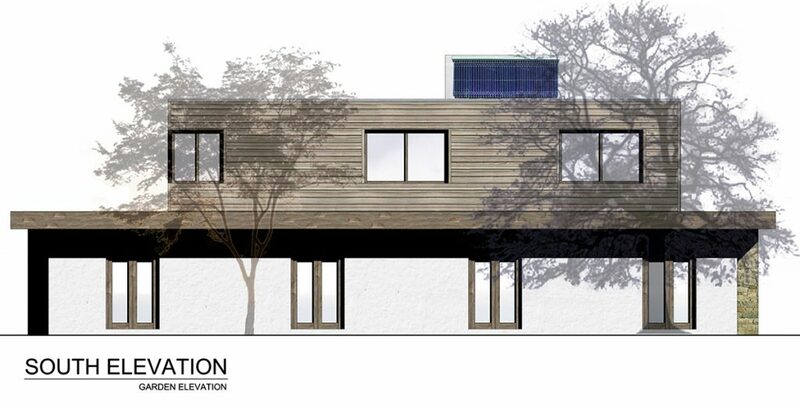 This proposal is for a contemporary style house, but what is a contemporary house? First of all, contemporary style should not be confused with modern style architecture. Modern style architecture emerged at the beginning of the 20th century as a result of new materials; steel, glass, concrete and a desire to do away with excessive unnecessary decoration. Modernism is no longer a relevant style of architecture to today’s needs. On the other hand traditional style houses suffer from a few main problems when designed for today’s needs. Today’s houses are much larger than traditional cottages were and traditional cottages were based around people living from the land, and not by way of a car. Also when modern technologies, like solar panels, are installed on traditional style houses, they take away from the traditional appearance of the house. But these technologies are important to help Ireland reduce its carbon emissions. When today’s needs are accommodated in a traditional style house the results can sometimes be disastrous and result in oversized clones from a past era. Contemporary architecture is the architecture of today. It should reflect today´s: 1.Client´s needs 2.Materials 3.Technology 4.Location and 5.historical context. Today´s Materials serve today´s specific needs. Timber is used for the structure (see eco point 5 below), doors, window frames and 1st floor cladding. Grass is used as the roofing material. These products are renewable materials that helps reduce the creation of Carbon Dioxide which is an important issue for today. Today´s Technology. Solar panels are so beneficial in so many ways that it would be foolish not to include them on any new house (even planning legislation acknowledges this by exempting them from planning permission). They will save energy, save money and help Ireland reduce its carbon dioxide emissions. In this house the solar panels have been made a feature above the stairs. The form of the house is designed to enhance passive solar gains and reduce heatloss, again to reduce the carbon footprint of the building. Location. As it is of primary importance to design low energy buildings, the location of the house to the north of the site and its orientation to the south are important in helping it achieve the required energy requirements. Historical context. In order to give new buildings some integrity it is important to link them to the past from which they have evolved. At the same time a building should also represent current beliefs and be something that future generations can look back on with pride and understanding of the times we now live in. This project uses the references to Kilcarron house and estate as a way of linking it to the past, but it is also designed in a contemporary manner that represents our current need to cut energy use and protect the environment. As every aspect of the project is interwoven many of the points are cross linked and repeated under multiple headings. This only proves to highlight the integrated approach to design that has been used for this house. The use of vegetation and landscaping to protect the house against dominant prevailing winds. The house is located so that the outdoor living areas are on the sunny south side of the house. Existing trees and hedgerows will be preserved and additional planting will take place to provide natural habitat for native birds and insects. The house is designed to increase solar gains therefore reducing energy used for heating. Warmer habitable rooms are on the south side while cooler service rooms on the north side. Glazing on the south façade has been maximised to increase solar gains while windows are limited to the north to reduce heat loss. Sedum Mat Green roof. Typically when a house is built on a green field site the existing nature where the house is to be placed is destroyed. But when the house has planted roofs, this is not the case; instead a new habitat is created for plants and insects. In addition grass roofs do not create impermeable surfaces that have to be drained. They have a capacity to retain and absorb rain water therefore stabilising the flow of water discharged. Grass and soil do not require manufacturing therefore do not produce waste during production and do not diminish mineral resources, unlike concrete or metal that depletes natural resources and generate tons of carbon in their production. In addition planted roofs will neutralise a large quantity of carbon over its working life, making for a more sustainable future. Walls will be constructed using timber frame construction. Timber being a renewable material, unlike concrete, does not require large amounts of carbon to fabricate. The trees growth also helps absorb carbon gasses and when timber is put into a building carbon is essentially taken out of the atmosphere and locked away. Plus timber frame construction allows higher levels of insulation to be installed, further reducing energy consumption. On the walls that require a masonry finished, recycled natural stone has been selected. Natural stone has the advantage that it does not require manufacturing (which produces carbon) and it can be sourced locally. Also the advantage of using recycled stone means that the walls will have a natural weathered look rather than looking fresh out of the quarry. Superior levels of insulation will be installed. Insulation is the simplest form of energy reduction and environmental protection in a house. As the largest amount of energy consumed in a standard house is for space heating, by reducing this need you are making simple energy savings. And the greatest benefit of insulation is that once it is installed it costs nothing to run, unlike other heating systems. All details are designed to almost eliminate all cold bridging. High levels of insulation are well and good, but you still need a structure to the house, and this can lead to cold bridging at edges and through the structure itself. Once this problem is recognised an experienced designer can detail the structure to reduce all this cold bridging, therefore increasing the overall insulation of the house and reducing energy loss. High performance glazing. Window are always an area of higher heat loss due to their relative low insulation quality, but glazing technology is currently undergoing a revolution and even higher standards of heat retention are achievable. A U-Value of 1.1W/m²K is readily available and with U-Values of 0.6 W/m²K (as used on my own house that was featured on Duncan Stewarts “about the house” TV program) entering the market, heat loss through windows can be controlled. For this project a minimum U-Value of 1.1 W/m²K will be used. Timber Window Frames. Timber is a renewable material, unlike aluminium or PVC which depletes mineral resources and creates excessive waste. It also has a better insulation value. Many timber frame houses are clad in a layer of blocks which counteracts many of the environmental benefits of timber frame construction (because huge amounts of carbon dioxide are produced in the manufacture of cement). This project is clad in timber. Its growth also helps absorb carbon gasses and when timber is put into a building carbon is essentially taken out of the atmosphere and locked away. The use of environmentally friendly cement. Even though this is a timber frame house, concrete is still necessary for the foundations and floor slab but unfortunately most concrete is made using Portland cement which consumes huge amounts of energy to manufacturer. Luckily an Ecocem product is now available in Ireland which is produced from a waste product of the steel industry, GGBS. This hugely reduces the carbon footprint created with the use of concrete. Use cellulose recycled newspaper insulation. It doesn’t have the high levels of embodied energy (energy required to manufacture and therefore the quantity of carbon created during production) associated with chemical insulations, plus it reuses a waste product. Now it is being manufactured in Ireland, further reducing energy consumed for transportation and reducing the amount of waste produced in Ireland. Also, because it is installed through a system of pumping, it means cold gaps and drafts in the construction are simply eliminated. There is no point in insulating a house unless it is draft proof. And we don’t just mean the doors and windows because a surprising amount of air escapes through gaps in the construction and fixtures. This warm air has consumed energy to heat, and it is just being let escape. The solution is to provide an airtight vapour barrier outside a service cavity. This insures that the electrical and plumbing services do not puncture the air tight seal and has the added advantage of providing higher insulation levels. A further benefit is that moisture is blocked from entering the structure, eliminating potential rot and mildew. Even a super insulated house has to be ventilated to ensure good indoor air quality. But ventilation means heat loss, doing away with the benefits of additional insulation. This does not have to be the case, because by installing a ventilation heat recovery unit, the air that is entering the building is heated by the air exiting the building. This makes huge energy savings and ensures an even higher standard of air quality than conventional means of ventilation, and Energy Savings = Environmental Benefit. Vacuum tube solar water heaters. They will meet a large amount of the house’s hot water need substantially reducing fossil fuel consumed. Vacuum tube solar water heaters have a higher efficiency than flat plate solar panels and are more suited to the Irish climate. Even in winter the tubes are effective by increasing the temperature of the water, which decreases the energy used to heat the water. Permeable external pavements, driveways and paths. Creating large areas of sealed parking and paving causes even more rainwater to be directed into a treatment system or drainage system. This deprives the soil of ground water, causes more flooding and places a higher demand on drainage systems. This does not need to be the case, by the simple use of permeable surfaces, such as gravel and specially designed paving, rainwater is allowed to percolate into the ground. There will not be a concrete path running around the whole building which would isolate it from the site and surrounding landscape. Instead plants and the lawn will grow beside the wall of the house. See attached pages 20 & 22 from the County Cork Rural House Design Guide for further information. A solid wood burning stove will provide space heating and additional water heating. Felled trees are in abundant supply around the farm, therefore transport of fuel will have minimal environmental impact. Timber is a renewable energy source because the amount of CO2 produced during burning is equal to the amount of CO2 the tree absorbs in growing, therefore timber as a energy source can be carbon neutral. The house is designed to increase solar gains therefore minimising energy used for heating. Warmer habitable rooms are on the south side while cooler service rooms on the north side. Glazing on the south façade has been maximised to increase solar gains while windows are limited to the north to reduce heat loss. Grass sod roof. Typically when a house is built on a green field site the existing nature where the house is to be placed is destroyed. But when the house has planted roofs, this is not the case; instead a new habitat is created for plants and insects. In addition grass roofs do not create impermeable surfaces that have to be drained. They have a capacity to retain and absorb rain water therefore stabilising the flow of water discharged. Grass and soil do not require manufacturing therefore do not produce waste during production and do not diminish mineral resources, unlike concrete or metal that depletes natural resources and generate tons of carbon in their production. In addition planted roofs will neutralise a large quantity of carbon over its working life, making for a more sustainable future. Where a masonry finished is used, recycled natural stone has been selected. Natural stone has the advantage that it does not require manufacturing (which produces carbon) and it can be sourced locally. Also the advantage of using recycled stone means that the walls will have a natural weathered look rather than looking fresh out of the quarry. All details are designed to almost eliminate all cold bridging. High levels of insulation are well and good, but you still need a structure to the house, and this can lead to cold bridging at edges and through the structure itself. Once this problem is recognised an experienced architect can detail the structure to reduce all this cold bridging, therefore increasing the overall insulation of the house and reducing energy loss. Timber Window Frames. Timber is a renewable material, unlike aluminium or PVC which depletes mineral resources, creates excessive waste and produce harmful dioxins. It also has a better insulation value. Many timber frame houses are clad in a layer of blocks which counteracts many of the environmental benefits of timber frame construction (because huge amounts of carbon dioxide are produced in the manufacture of cement). This project is clad in a rendered timber fibreboard system. Growing timber helps absorb carbon gasses and when timber is put into a building carbon is essentially taken out of the atmosphere and locked away. Even a super insulated house has to be ventilated to ensure good indoor air quality. But ventilation means heat loss, doing away with the benefits of additional insulation. This does not have to be the case, because by installing a ventilation heat recovery unit, the air that is entering the building is heated by the air exiting the building. This makes huge energy savings and ensures an even higher standard of air quality than conventional means of ventilation, and Energy Savings = Environmental Benefits. Flat plate solar thermal water heaters. They will meet a large amount of the house’s hot water need substantially reducing fossil fuel consumed. Even in winter the panels are effective by increasing the temperature of the water, which decreases the energy used to heat the water. The panels are integrated into the roof, to further increase their efficiency and make use of them as a cladding material, reducing the amount of material needed. A wood burning stove will provide space heating and additional water heating. Wood is a renewable source and is carbon neutral i.e. the carbon produced when burning the wood is absorbed during the growth of the trees.